Pakistan is a country in South Asia. 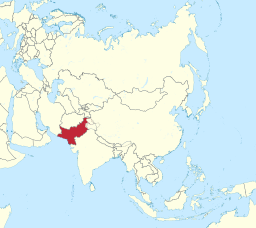 It is the fifth most populous country with a population exceeding 22,742,631 people. In area, it is the 33rd largest country spanning 340,509 square miles. The diversity of the landscape and climate in Pakistan allows a wide variety of trees and plants to flourish. The forest range from coniferous alpine and subalpine trees such as spruce, pine, and deodar cedar in the extreme northern mountains to deciduous trees in most of the country, to palms such as coconut and date in the Southern Punjab, southern Balochistan and all of Sindh. The western hills are home to juniper, tamarisk, coarse grasses, and scrub plants. Mangrove forests form much of the coastal wetlands along the coast in the south. The southern plains are home to mongooses, vits, hares, the Asiatic jackal, the Indian pangolin, the jungle cat, and the desert cat. There are mugger crocodiles in the Indus, and wild boar, deer, porcupines, and small rodents in the surrounding areas. The sandy scrublands of central Pakistan are home to Asiatic jackals, striped hyenas, wildcats and leopards. The lack of vegetative cover, the severe climate, and the impact of grazing on the deserts have left wild animals in in a precarious position. The chinkara is the only animal that can still be found in significant numbers in Cholistan. A small number of nilgai are found along the Pakistan-India border and in some parts of Cholistan. 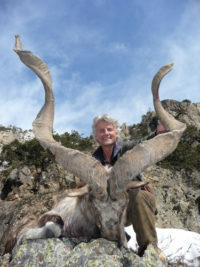 A wide variety of animals live in the mountainous north, including the Marco Polo Sheet, the Urial, the Markhor goat, the Ibex Goat, the Asian Black Bear, and the Himalayan Brown Bear. Among the rare animals found in the area are the snow leopard and the blind Indus River Dolphin, of which there are to be about 1,100 remaining, protected at the Indus River Dolphin Reserve in Sindh.